The forces of the Kingdom are engaged in war with the nation of Luitox. Their forces are far from home, hemmed in by a dense jungle, and facing unimaginable danger. Meanwhile, their home land is in chaos and the average soldier is just trying to make it home alive. Crossbowmen, dragon pilots, and mages will need to band together to survive a battle, where the greatest enemy may be their own leaders. On April 30th, 2015 it will be the 40th anniversary of the Fall of Saigon, and the end of the Vietnam War. The Vietnam War had a deep impact on American popular culture, and science fiction and horror are not exempt from this. Whether it is used as a metaphor for chaos and fear, a part of a characters back story, or as a setting, the War cast a long shadow. 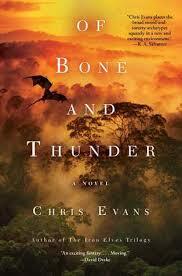 Chris Evans, in his book Of Bone and Thunder, has presented a novel that serves as both commentary and reminder of the experiences of the battlefield soldier. The novel presents a number of characters fighting a war in a far off jungle kingdom. Many of the characters are commonly seen in pop culture representations of the Vietnam War. There is the drug addicted crossbowman trying to survive, the Lieutenant fresh out of training who is more dangerous to his men then the enemy, and the grizzled, experienced Sergeant ready to protect his men. The characters are not the only reflection of the actual war. Dragons in the book are used in the role helicopters occupied in the Vietnam War. There is talk of political unrest at home in the Kingdom. (a combination of the Kenned Assassination/Watergate) There are Dwarves, recently integrated into the army and subject to prejudiced. There is even a reporter who has come to the war zone to experience it for herself. By mirroring real events, people, and battles from the Vietnam War, Evans creates a timeless story of people in combat. I enjoyed this book, although having worked with a Vietnam War collection in my library I found that I was constantly trying to figure out what each event was referencing, and that took me out of the story. You do not need any familiarity with the events of the war to understand the book however. If you are interested in a unique take on military fantasy then check this book out. R Point (2004) directed by Kong Su-chang: A Korean horror film, this movie focuses on a platoon of South Korean soldiers attempting to secure a haunted outpost during the Vietnam War. Koko (1988) by Peter Straub: A group of Vietnam War veterans reunite to track down one of them who may or may not be a serial killer in Southeast Asia. The Reckoning (2004) by Jeff Long: An American journalist is sent to Cambodia to cover the search for an American pilot missing since the Vietnam War and uncovers an ancient mystery.